eDepartment of Bioengineering (J.C.), George Mason University, Fairfax, Virginia. BACKGROUND AND PURPOSE: Robust wall apposition for flow-diverter stents may be important for endothelialization. Using a large series of experimental aneurysms treated with the Pipeline Embolization Device, the objectives of this study were to 1) assess interobserver agreement for the evaluation of wall apposition on posttreatment DSA and evaluate its association with aneurysm occlusion, and 2) measure the relationship between wall apposition assessed with histology and aneurysm occlusion rate after treatment. 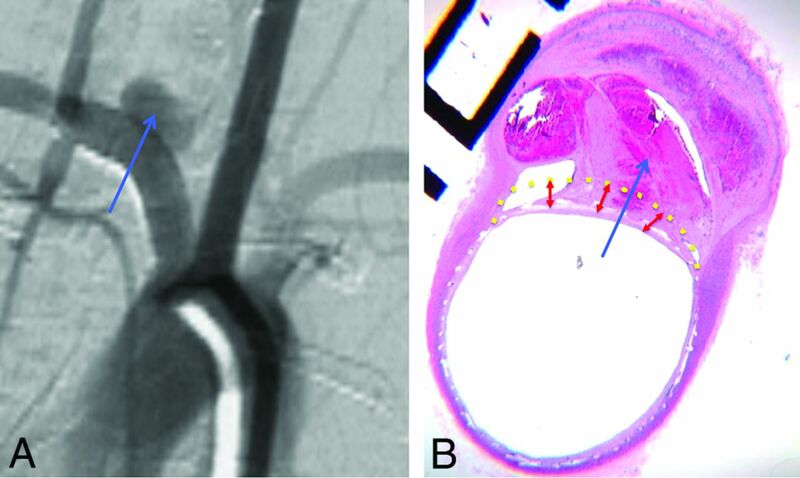 MATERIALS AND METHODS: Saccular aneurysms were created in 41 rabbits and treated with the Pipeline Embolization Device. DSA was performed just after the deployment of the device and at follow-up. Three investigators independently graded wall apposition on posttreatment DSA as good or poor. A histopathologist blinded to the angiographic results graded the wall apposition on histologic samples. We examined the correlation between angiographic occlusion and wall apposition with histology and angiography. RESULTS: Wall apposition evaluated on histology was strongly associated with saccular aneurysm occlusion. Sensitivity and specificity of wall apposition to predict complete occlusion at follow-up were 76.9% and 84.0%, respectively, with an overall accuracy of 81.6%. In this experimental study, DSA was suboptimal to assess flow-diverter apposition, with moderate interobserver agreement and low accuracy. CONCLUSIONS: Good wall apposition is strongly associated with complete occlusion after flow-diverter therapy. In this study, DSA was suboptimal for assessing wall apposition of flow-diverter stents. These findings suggest that improved tools for assessing flow diverter–stent wall apposition are highly relevant. Using a large series of elastase-induced aneurysms in rabbits treated with the Pipeline Embolization Device (PED; Covidien, Irvine, California), the objective of this study was to assess interobserver agreement for the evaluation of wall apposition on posttreatment DSA, evaluate its association with aneurysm occlusion, and measure the relationship between wall apposition assessed with histology and aneurysm occlusion rates after implantation. The Mayo Clinic Animal Care and Use Committee approved the animal procedures. Some rabbits used in this study were originally used in other investigations.9,10 Elastase-induced aneurysms were created in 41 New Zealand white rabbits. Aneurysm creation procedures were performed as previously described by our study group.11 Aneurysms were treated at least 3 weeks after creation.12 Subjects were premedicated with aspirin (10 mg/kg orally) and clopidogrel (10 mg/kg orally) 2 days before the treatment procedure; this medication regimen was continued for 1 month after embolization. The detailed procedure was previously published.9,10 All endovascular procedures were performed with the Advantx DLX (GE Healthcare, Milwaukee, Wisconsin) Angio Suite equipped with an image amplifier. Imaging field of view was 11 cm with a frame rate of 2 frames per second, and the x-ray dose per frame was 500 μR. The spatial resolution was 1.5 lines pairs per millimeter. A 5F guide catheter (Envoy; Codman & Shurtleff, Raynham, Massachusetts) was briefly placed into the aortic arch, and DSA was performed. Heparin (500 U intravenously) was administered, and then a microcatheter (Marksman; Covidien) was placed over a microguidewire (Transend; Stryker, Kalamazoo, Michigan) into the subclavian artery distal to the aneurysm cavity. The wire was removed and the PED was advanced into the distal aspect of the microcatheter. The device was deployed across the neck of the aneurysm from the subclavian artery to the brachiocephalic trunk, with no protrusion of the proximal landing zone in the aortic arch. The microcatheter was removed, and DSA was performed through the guide catheter 5 minutes after deployment. No additional angioplasty to improve wall apposition or 3D acquisition were performed. The implanted PED was selected according to the diameter of the artery. Details regarding proximal and distal diameters of the parent artery as well as the size of the implanted PEDs are available in the On-line Table. Rabbits were humanely killed at day 30 (n = 18), day 90 (n = 11), and day 180 (n = 12) after the procedure. At the time of death, the animals were deeply anesthetized. DSA of the aortic arch was performed to evaluate aneurysm occlusion. The animals then were euthanized with a lethal injection of pentobarbital. Aneurysm and parent artery tissue were immediately fixed in 10% neutral buffered formalin. A single experienced reader, blinded to wall-apposition status (DSA and histologic evaluations), assessed angiographic aneurysm occlusion at follow-up according to a 2-point classification: complete (100%) or incomplete occlusion. Selected postprocess (pixel shift) images of the posttreatment DSA were independently examined by 3 investigators, blinded to histologic wall-apposition evaluation, to grade wall-apposition status on posttreatment DSA. Wall-apposition status on DSA was evaluated according to a dichotomous outcome, noted as either good or poor apposition depending on the presence or absence of visible contrast media between the stent and the parent artery. (Illustrative images for good and poor wall apposition are presented in On-line Figs 1 and 2). Histopathologic Processing and Wall-Apposition Evaluation. A histopathologist blinded to the angiographic results did the processing and analysis for wall apposition as previously described.9 After routine tissue processing, the fixed samples were embedded in paraffin. Aneurysm samples were processed at 1000-μm intervals in a sagittal orientation with use of an IsoMet Low Speed Saw (Buehler, Lake Bluff, Illinois). The metal stents were carefully removed under a dissecting microscope. The samples then were re-embedded in paraffin, sectioned at 5–6 μm, and stained with hematoxylin-eosin. Wall apposition was evaluated according to a dichotomous outcome, with either good or poor wall apposition of the stent. The evaluation was performed at the level of the aneurysm neck. A good histologic wall apposition meant that the stent was well apposed on the entire surface parent artery adjacent to the aneurysm ostium. All statistical analyses were performed in R statistical and computing software version 3.1.1 (http://www.r-project.org/). κ and intraclass correlation coefficient statistics were calculated by using the irr package (version 0.84). Agreement among 3 readers for DSA assessment of posttreatment wall apposition was assessed by using the intraclass correlation coefficient method.13 Cohen κ was also displayed for pair-wise comparisons of raters. κ also was used to assess agreement between the reference method of histology and DSA by using a consensus score agreed to by 2 radiologists for each method. We calculated sensitivity, specificity, and accuracy of posttreatment DSA and histologic wall-apposition evaluations in predicting the occurrence of aneurysm occlusion at follow-up. The Wilson Score 95% CI is reported for each statistic. The Fisher exact test was performed to test for association between wall apposition assessed by histology at follow-up and occlusion outcome at follow-up. This study included 41 consecutively treated rabbits. All aneurysms were saccular. The mean aneurysm size was 9.41 mm (95% CI, 8.41–10.41) in the complete-occlusion group and 9.47 mm (95% CI, 8.03–10.91) in the incomplete-occlusion group. There was no significant difference in aneurysm sizes across groups (t test P value = .94). The length of follow-up varied from 30 days to 180 days, with a mean length of 90 days. Rabbits were euthanized at day 30 (n = 18), day 90 (n = 11), and day 180 (n = 12). Follow-up DSA was available for 40 rabbits, of which 67.5% (n = 27) had complete occlusion and 32.5% (n = 13) had incomplete occlusion. Angiographic complete-occlusion rates at 30, 90, and 180 days were not statistically different at 52.9% (n = 9), 72.7% (n = 8), and 83.3% (n = 10), respectively (χ2 P value = .25). Immediate posttreatment DSA was available for 41 rabbits. Wall-apposition status evaluated on posttreatment DSA by the 3 independent readers demonstrated a good wall-apposition rate of 61.0% (n = 75 of 123 readings) and a poor wall-apposition rate of 39.0% (n = 48). The consensus DSA evaluation yielded 63.4% (n = 26) good wall apposition and 36.6% (n = 15) poor wall apposition. All 3 readers rated similar proportions of wall apposition as poor (n = 16; 39%). Pair-wise κ between the 3 readers for DSA was κ = 0.487, 0.590, and 0.385. Intraclass correlation among readers was 0.488 (95% CI, 0.30–0.66), indicating moderate interobserver agreement. A contingency table is presented in Table 1. Sensitivity and specificity of good wall apposition evaluated on posttreatment DSA for the prediction of complete versus incomplete occlusion on follow-up DSA were 23.1% (95% CI, 8.2–50.3) and 55.5% (95% CI, 37.3–72.4), respectively. The overall accuracy of the wall apposition evaluated on posttreatment DSA for the prediction of complete versus incomplete occlusion at follow-up was 45.0% (95% CI, 30.7–60.2). Histologic evaluation at time of follow-up DSA was available for 38 rabbits, of which 63.2% (n = 24) had good wall apposition and 36.8% (n = 14) had poor wall apposition. Illustrative histology images for good and poor wall apposition are presented in Fig 1 and Fig 2, respectively. A contingency table is presented in Table 2. Angiographic complete occlusion rates in good wall-apposition aneurysms of 77.8% (7 of 9) at 30 days, 100.0% (6 of 6) at 90 days, and 88.9% (8 of 9) at 180 days were not statistically different (χ2 P value = .44). Angiographic complete occlusion rates in poor wall-apposition aneurysms of 25.0% (2 of 8) at 30 days, 25.0% (1 of 4) at 90 days, and 50.0% (1 of 2) at 180 days were not statistically different (χ2 P value = .77). Histology and DSA illustrative correlation of good wall apposition associated with complete aneurysm occlusion. A, Follow-up DSA objectively shows complete occlusion of the aneurysm sac. B, Photomicrograph (hematoxylin-eosin staining, original magnification ×100) at the level of the aneurysm neck shows perfect wall apposition with complete aneurysm pouch occlusion filled with conjunctive tissue when using the PED. 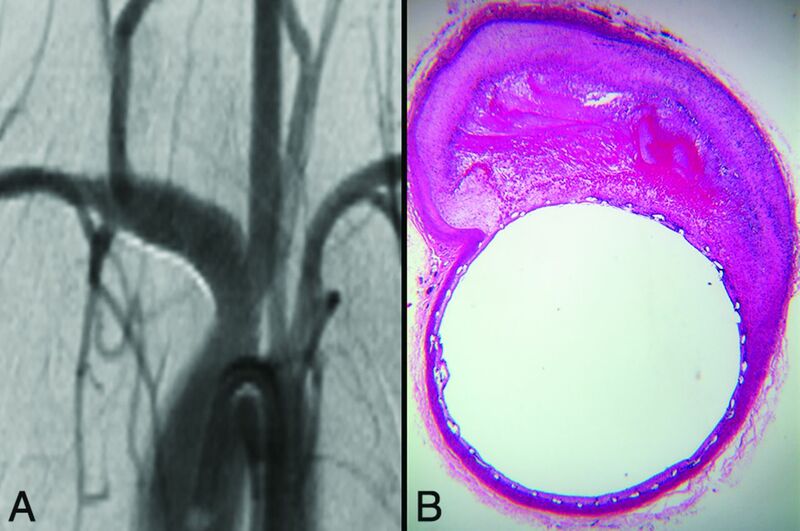 Histology and DSA illustrative correlation of poor wall apposition associated with incomplete aneurysm occlusion. Follow-up DSA objectively shows incomplete occlusion of the aneurysm sac (blue arrow) (A). Photomicrograph at the level of the aneurysm neck (hematoxylin-eosin staining, original magnification × 100) shows poor wall apposition (yellow dotted line) and filling of the aneurysm pouch with a partial thrombosis in the aneurysm sac (B). Sensitivity and specificity of wall apposition evaluated on histology for the prediction of complete versus incomplete occlusion on follow-up DSA were 76.9% (95% CI, 49.7–91.8) and 84.0% (95% CI, 65.3–93.6), respectively. The overall accuracy of the wall apposition evaluated on posttreatment DSA for the prediction of complete versus incomplete occlusion at follow-up was 81.6% (95% CI, 66.6–90.8). Histologically assessed wall apposition was significantly associated with occlusion at follow-up DSA (Fisher exact test P value <.001; odds ratio, 15.7; 95% CI, 2.63–133.2). Our study of a large series of experimental aneurysms demonstrated that wall apposition is a crucial determinant for saccular aneurysm occlusion after FDS treatment. Wall apposition on histology was strongly correlated with aneurysm occlusion after treatment of intracranial aneurysms with flow diverters, suggesting that if good wall apposition is not present, adjunctive measures such as balloon inflation should be considered in some clinical settings to improve apposition and, thus, aneurysm occlusion rates. This study correlates flow-diverter wall apposition with saccular aneurysm occlusion by using histologic evaluation. This is of high importance because wall apposition can be considered a key factor for the occurrence of saccular aneurysm nonocclusion. A potential biologic mechanism that could explain lower occlusion rates in cases of poor wall apposition is the fact that aneurysm occlusion after flow-diverter stent treatment is not exclusively related to intra-aneurysmal thrombosis, but is also driven by endothelialization of the device.4 This endothelialization is relatively delayed and, we believe, derived exclusively from cells in the adjacent parent artery.4 Based on this proposed mechanism, the malapposed portion of the device will fail to endothelialize because of the lack of direct contact with the parent artery in cases of poor wall apposition. This mechanism has also been discussed in the coronary intervention literature, and coronary stents that lack wall apposition fail to endothelialize.5,16 Though our study proves that wall apposition is highly correlated with angiographic outcome, we also found that DSA was a suboptimal tool in assessing wall apposition. Our current results are in accordance with the clinical study published by Saake et al,6 who, in a study with 14 patients and evaluations made in consensus by 2 experienced neuroradiologists, reported that wall apposition was difficult to assess on intra-arterial DSA. In their study, they did not find any significant difference between DSA and intravenous angiographic CT related to the deployment of the FDS, wall apposition of the stent in the nonaneurysmal parent vessel segments, and the aneurysmal neck coverage by the stent, but the reviewers preferred intravenous angiographic CT for evaluation of wall apposition. Beyond the fact that the angiography suite used in this experimental study is not optimal and differs from clinical ones, there are some explanations for why 2D DSA might be suboptimal in assessing wall apposition. 2D DSA cannot provide cross-sectional images; thus, there are limited views examining the relationship between the FDS and the vessel wall. In addition, DSA imaging acquisition is based on mask subtraction, making assessment of any contrast opacification between the subtracted device itself and the arterial wall quite difficult. Furthermore, there was motion artifact in our study because the experimental aneurysms are not located in the brain, but in the thorax, and are subject to ventilation movements. Newer tools are currently being evaluated in the setting of FDS treatment of intracranial aneurysms to assess wall apposition. Flat panel CT with intra-arterial or intravenous opacification has a very high spatial resolution and can be done directly on the DSA table without any additional invasive procedure and with low radiation.6,7,17⇓⇓⇓⇓–22 More recently, optical coherence tomography has been evaluated for intracranial procedures.8,23⇓⇓⇓–27 In addition, other endovascular techniques that are primarily used in cardiology but not yet used in neuroradiology, such as intravascular sonography24 or endoluminal optical imaging (angioscopy),28 seem promising in the assessment of wall apposition. Our study suggests that these tools could someday be preferred over DSA for the assessment of wall apposition. Our study is limited by its retrospective nature and the use of only selected images for the DSA readers' assessment. In addition, it is possible that a newer-generation angiography suite could provide better DSA images; 3D runs with multiplanar reconstructions might be better than 2D DSA to assess wall apposition, but we did not perform these acquisitions. Another limitation to our study is the motion artifact associated with the respiratory and cardiac motion in these rabbit aneurysms. However, it is important to point out that all images underwent postprocessing, including pixel shifting by an experienced radiologist before assessment by the blinded readers. Another limitation of this study is that only 1 experienced reader evaluated the histologic samples. However, this reader was blinded to the DSA outcomes. Regarding the choice of the appropriate device, sizing was sometimes difficult because of discrepancies in the artery diameter between the proximal and distal parts, but the braided stents have the ability to expand beyond their labeled diameter. We did not use a previously published classification for wall-apposition assessment because we mainly focused at the level of the aneurysm neck, whereas the available classifications discussed the device deployment in the parent artery and not specifically at the neck.6 Another limitation of this study is that rabbits were killed at different time points, which can modify the outcomes after implantation of the PED depending on the length of follow-up. However, we did not observe any statistically significant impact of time on complete occlusion rates. Also, this study focused on wall apposition as a key factor influencing aneurysm occlusion after flow diversion, but some other criteria that have not been analyzed in this specific study are also of high importance, such as hemodynamic effects, intra-aneurysmal thrombosis, and mesh attenuation. This study highlights that good wall apposition is key in obtaining complete occlusion of saccular aneurysms after FDS treatment. In this study, 2D DSA was found suboptimal for assessing wall apposition of FDSs, with only moderate interobserver agreement and low accuracy. Our inability to perform high–frame rate DSAs and C-arm CT acquisitions to evaluate wall apposition must be considered when assessing the significance of these results. Our study suggests that development of new tools for the assessment of wall apposition for flow-diverter stents is needed to improve angiographic outcomes in patients treated with FDSs. Disclosures: Juan Cebral—RELATED: Grant: National Institutes of Health, Comments: research grant*; UNRELATED: Grants/Grants Pending: National Institutes of Health,* Philips,* Comments: research grants. David F. Kallmes—UNRELATED: Board Membership: GE Healthcare,* Comments: cost-effectiveness board; Consultancy: ev3/Covidien/Medtronic,* Comments: planning and implementing clinical trials, clinical events committee, and steering committee; Grants/Grants Pending: MicroVention,* Sequent,* Neurosigma,* Surmodics,* Codman,* ev3/Covidien/Medtronic,* Comments: preclinical research, clinical trials, and supply of devices; Travel/Accommodations/Meeting Expenses Unrelated to Activities Listed: ev3/Covidien/Medtronic,* Comments: presentation at FDA panel meeting. Ramanathan Kadirvel—RELATED: Grant: National Institutes of Health. *Money paid to the institution. This work was supported by research grant NS0767491 from the National Institutes of Health and Medtronic. Aymeric Rouchaud was supported by research grants from the French Society of Radiology and Therese Planiol Foundation. Accepted after revision April 27, 2016.